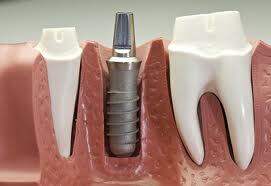 Dental implants will help you to look and feel younger because they prevent bone loss. By preventing bone loss that would normally occur with the loss of teeth, your facial structures remain normal and intact. The chances of wrinkling and looking older before your time are less likely. In other words, every day that you continue wearing dentures, or having missing teeth, you experience bone loss, which makes you look much older than you are. By using dental implants, your facial structures and jaw bones remain strong, healthy, and intact. This is especially important when all the teeth have been lost, because the lower third of the face collapses if implants are not placed to preserve the bone. with replacement teeth that look, feel and function more like natural teeth. You will look younger and more attractive which will allow you to be more confident and enjoy smiling, laughing, and talking to the others. because you can chew the food better which will prevent malnutrition and stomach problems due to poor digestion. Fresh vegetables and fruits are back on the menu! You can now eat the foods you like! You will be able to taste foods better. A lot of patients complain that wearing an upper denture prevents them from tasting the food well, as the roof of the mouth is covered with the denture. With implant supported replacement teeth, it is not necessary to cover the entire roof of the mouth, so you can truly enjoy the taste of the food. Most of our patients love their new implant supported dentures because of their improved appearance, function, comfort and health. Implants allow you to relax and not to worry about your dentures moving around, popping out, or gagging you. You’ll never worry about your dentures flying out when you laugh, sneeze, cough, or when you eat. Also, your new smile will have people to give you compliments galore. By replacing the entire tooth as well as the tooth root, it is possible to replicate the function of natural teeth, with a strong, stable foundation that allows comfortable biting and chewing. Also, nothing in the mouth looks or feels false or artificial! Since the dentures are securely attached to the implants, there is no need for messy denture adhesives.